It was a very cold, wet day when I went to the Malvern Spring Show this year, the same day that BBC Gardeners’ World were filming so everyone was dodging the showers to try to get some photos. This is the first show of the year and Malvern had the honour of officially becoming an RHS (Royal Horticultural Show). This really puts Malvern on the map and will increase the standard and number (I hope) of show gardens there. It’s not a particularly easy show to do a garden for – it’s very early in the year so plants need to be brought on, usually under glass, to get them looking anything like ready. It is also a very exposed site with high winds coming through and damaging any soft plant material. The organisers had this year moved the show gardens further into the showground and most of the designers and landscapers I spoke to were very happy with this decision. It put them more in thick of things, whereas before it was possible to feel a little cut off from the main area of the show. It also meant they were a little more sheltered from that westerly wind. The weather can also be very changeable; this year the build time had enjoyed very good weather, but as I said earlier the first day of the show was wet and windy again! With all this in mind it must be said that anyone who can get a show garden together and win a medal is doing really well. 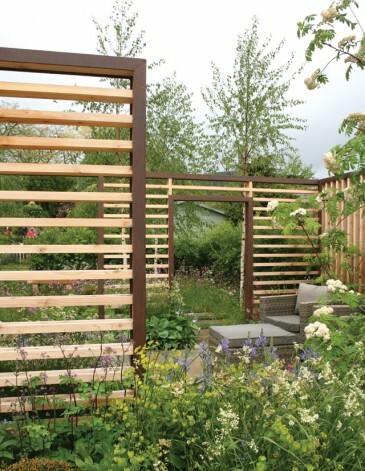 To get an RHS gold medal is excellent and there were two gardens that achieved it this year. The judges are RHS judges and always have been, so the standard is the same as Chelsea and any other RHS show. Of the two gold-winning gardens I had a favourite – actually a favourite for the whole show as I really felt it stood apart from all the others. This was “Bringing Nature Home”, designed by Mark Draper and built by graduate gardeners based in Gloucestershire. They have won numerous gold medals at Malvern, but I think this was the best they have ever done – let me try and explain why. I prefer the story behind a show garden to be simple, rather than have someone explain a concept to me in long rambling tones. I need to stand and look and ‘get it’ in a few minutes, and this garden did just that. Instantly you could see that it was divided into two sections. The front section had an ordered homely feel – my only reservation was the rattan furniture, which is everywhere at the moment and so unoriginal, but that was the only negative for me. The back section beyond the screens and water feature was a wildflower meadow flowing out to a little gate. What Mark had achieved so well with this garden was the views through it. From any angle, whether at the front, side or rear, you constantly had exciting and enticing views into another section, which really made you want to go in and explore the garden. Because the screens created an open effect, none of the views were lost if you were an observer on the outside rather than walking through the garden. The execution of the hard landscaping was exquisite, and the planting was wonderful, full and interesting. At the front Mark had used a plant called Luzula nivea (its common name is snowy woodrush), a white flowering grass that can tolerate some shade and poor soil as long as it is well drained. It is a very elegant plant and not one you see very much, but I had used it in my first Chelsea garden. It was in perfect flower so I guessed it must have been brought on a bit under glass, as it would usually flower in June and July. Alongside the Luzula, planting of the bulb Allium ‘Purple Sensation’ was popping up through a carpet of Euphorbia, the low-growing one which is Euphorbia x robbiae, with its yellow bracts in full colour at this time of year. Along the front of the garden, in a border right by your feet, the planting was full to overflowing – just as a show garden should be – with Achemilla mollis tucked in next to Epimedium x rubrum with its lovely heart-shaped leaves just showing some colour. The planting at the back of the garden in the wildflower area was just how a perfect English meadow should look, frothy with cow parsley and red campion (which is actually pink flowered). The slightly overgrown hawthorn hedge and old metal gate completed the picture, and added to the views. A simple oak bench gave the idea that you could just sit and enjoy this garden. The only thing I feel sorry about is that this garden will be taken apart after the show – I hope the graduate gardeners have a good home for it to go to.